Initial construction has been completed at the UAE's first power reactor, Barakah 1. The operating company, Nawah Energy Company, must gain approval from national regulators before the final stage of loading fuel and bringing it into service. The APR-1400 pressurized water reactor has been built by a South Korean consortium for its customer Emirates Nuclear Energy Corporation (Enec). Initial construction covering 95% of work is complete, including tests of safety systems, said Enec. The remaining 5% of construction is the commissioning the reactor and final preparation of its 277 systems. This process starts with loading nuclear fuel into the reactor core, an operation which cannot take place until the Federal Authority for Nuclear Regulation (FANR) issues an operating licence to Nawah Energy Company, a joint venture of Enec and Kepco. Enec today announced that Nawah continues to work with FANR towards obtaining this operating licence. In addition the UAE nuclear community has committed to completing two voluntary pre-operation peer reviews before moving forward: one at the industry level with the World Association of Nuclear Operators, another at the national level with the International Atomic Energy Agency. It was expected that the FANR review and licence would be completed last of these. Enec applied for an operating licence in March 2015, but one year later created Nawah as a joint venture with Kepco to take that role instead. Nawah was boosted in July last year by an $880 million operating support services agreement where KHNP will supply 400 qualified staff until 2030. Yesterday Arabian Business reported that Nawah had finalised appointments to its board. Acting Nawah CEO Mohammed Sahoo alSuwaidi said: "As we move towards unit 1 fuel load, we recognise the scale of both our responsibilities and of the challenges that lie ahead of us. Nawah's commitment to meeting the highest standards of safety and quality in nuclear operations is what drives the work of all our personnel, who are striving to ensure that we meet FANR's expectations." 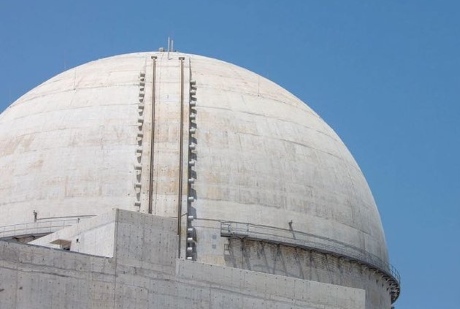 Enec said the start-up schedule for Barakah 1 had been moved back in accordance with "a desire to achieve the highest possible nuclear quality and safety standards ... as well as lessons learned from [the commissioning of] Shin Kori 3 in South Korea, the reference plant for Barakah". It added that the timeline includes an extension for the start-up of nuclear operations for unit 1, from 2017 to 2018, to ensure sufficient time for international assessments and adherence to nuclear industry safety standards, as well as "a reinforcement of operational proficiency for plant personnel". A spokesman for Enec told World Nuclear News it is "confident in the capacity to deliver" four APR-1400s by 2020, pending regulatory approval.